I have to say that when I indulge in a pancake, it has to be banana all the way. I love the way banana caramalizes in the pan to make a dessert like breakfast – right?? 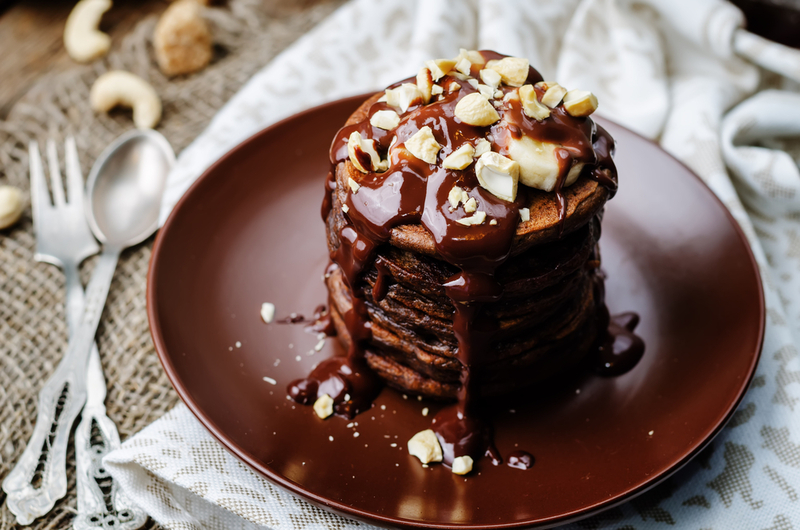 I also love to serve my chocolate banana coconut pancakes super warm with tons of different toppings, such as toasted nuts and seeds, coconut shreds, sliced banana, and even vegan chocolate sauce. Simply place all the ingredients in a food processor or high speed blender and blend until smooth. Heat the coconut oil in a Cast Iron skillet until it bubbles. Fry your pancakes in this delicious oil. When done, top with an indulgent dusting of Muscovado Sugar, toasted walnuts, organic berries, and if you’re feeling really decadent, some vegan chocolate sauce.